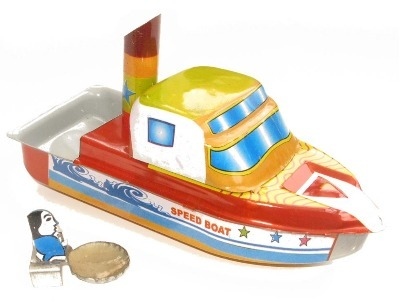 Welby Pop Pop Speed Boat. Approximately 6 3/4" (17cm) long. Complete with original / new fuel holder featuring the pilot and original candles. The box / instructions are in German, we will include instructions in English. The boat does have a few minor scratches to the cabin roof but overall very good condition.